Growing up, I wasn’t exposed to anime like some people my age were. During my formative years, we only had cable during football season, and I watched a lot of PBS. I knew that Pokémon and Dragon Ball Z were things that existed, but that was about the extent of my knowledge. I only say this to illustrate that I didn’t really know what anime was until middle school and didn’t watch any until high school, when a friend loaned me some of her DVDs. Most of these DVDs were movies by Studio Ghibli, and I’m glad they were my introduction to Japanese animation. It feels cliché and almost pointless to say, but Hayao Miyazaki is a master of filmmaking, and to some degree, his work has changed and shaped the way I look at film. I don’t love all of his or the studio’s movies, but today I’d like to talk about one I do love: 1997’s Princess Mononoke. 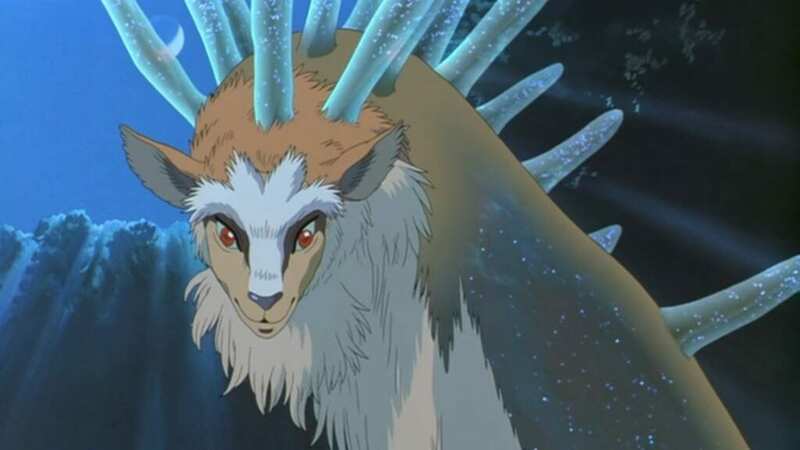 Although Princess Mononoke is titled in reference to its female lead, we follow a prince named Ashitaka throughout the film, and he serves as our point of view character. The action begins when a cursed boar god comes barreling through Ashitaka’s village, destroying everything in its path. He defeats the fallen god, now a demon, but it’s not an unblemished victory; the curse infects Ashitaka, warping and scarring his arm. The village wisewoman informs him that this curse will only spread and get worse, destroying his body and his soul. Despite the protests of grateful villagers, per their tradition, Ashitaka must cut his ponytail and leave the village, as good as dead to his people. He comes upon Irontown, a village that specializes in the production of – you guessed it – iron. Irontown is led by Lady Eboshi, a gun-wielding destroyer of forests and killer of gods and spirits. At odds with Lady Eboshi and her people are various such deities, most importantly Clan Moro, a family of wolf gods who travel with Princess Mononoke herself, a human girl named San, raised by Moro as one of her own. Ashitaka falls for San despite her animalistic nature and hatred of the humans. All-out war erupts as San and Moro want to kill Lady Eboshi, who wants to kill the great Spirit of the Forest. Can Ashitaka save his love, the Forest Spirit and his own soul? Princess Mononoke is a movie with a lot of ideas, but it knows how to present them in a digestible, entertaining way. One of the film’s principal themes is the struggle between nature and technology; specifically, humans like Lady Eboshi prioritize technology and the convenience it can offer them over the sacred forests and spirits that dwell there. The movie is set in a vaguely fictionalized ancient Japan, but the characters and their motivations feel modern because their conflicts are going on to this day. While Lady Eboshi isn’t introduced in the most positive light, she represents the complexity of the film’s view of this issue. Lady Eboshi is a complicated character who is difficult to categorize as simply good or evil. Her pursuit of weapons and technology is questionable, and she kills the boar god inciting the movie’s conflict. However, she’s also the liberator of countless girls, buying them from brothels and giving them honorable work in the town. She also saved and cares for a group of Lepers no one else would even look at. She doesn’t seem to have any sympathy for animals or the gods, but she is willing to do anything for her people and the oppressed people she encounters. She uses her iron to protect herself and her town and seems to view the spirits as a genuine threat to her goals. San is equally morally ambiguous and intriguing. At first, her resentment of other humans seems unfair, and she is unreasonable in her dealings even with Ashitaka, who has never slighted her and goes out of his way to help her. Her movement, appearance, and worldview are distinctly wild, and she has no head for diplomacy or level-headed conversation. “Mononoke” means “specter” in Japanese, and while this title is likely due to San being raised with wolf gods, one could also argue that she herself is much like a specter, unpredictable and restless. However, she comes to appreciate Ashitaka and his efforts, as well to accept the humans, if not forgive and befriend them. Ashitaka is my favorite character in the film. I love the way he surveys both sides of the situation without fully supporting either group. He loves San and wants to help her family and the other gods, but he can’t forsake the innocent people of Irontown or even Lady Eboshi. He wants to simply end the war altogether and find a way for everyone to live peaceably, but it just might be an impossible task; the two ways of life in question are diametrically opposed, and it seems his friends on both sides are unwilling or unable to budge an inch. Ashitaka is the epitome of a hero because he pushes onward to try and help both groups with the knowledge that he will die slowly and painfully either way. Like many people, I usually prefer to watch movies in their original language. Dubbed actors are usually dispassionate, unconvincing, and boring to listen to, and this can detract from even the best of films and series. However, Cowboy Bebop and anything by Studio Ghibli are two big exceptions in the world of Japanese animation. Princess Mononoke has a fantastic English voice cast, as Studio Ghibli productions tend to. Just take a look: Ashitaka is voiced by Billy Crudup, San is portrayed by Claire Danes, Gillian Anderson plays Moro, and Lady Eboshi is voiced by Minnie Driver. The film also features the talents of Billy Bob Thornton, John DiMaggio, Jada Pinkett Smith, Keith David, Tara Strong, and more! This dynamite group of performers is bolstered by intelligent, poignant dialogue translated by Neil Gaiman. My favorite performances come from Driver, David, and Anderson; the two women especially get some fantastic lines to deliver, and they sell every bit of what they’re saying. That’s what really makes the difference here: the actors sound as fervent about what they’re saying as the characters look. These believable performances make things like talking wolf gods easier to accept. Princess Mononoke’s original musical score was written by Joe Hisaishi, and it has to be heard to be believed. The music adapts wonderfully to each scene, whether it be calm, frantic, emotional, brutal, comedic, or dramatic. It’s so grand and epic, the only comparison I can think of is Hans Zimmer’s score for The Lion King. This is one of a few movie scores I can listen to any time, with or without the film itself. The real star here is “Legend of Ashitaka,” but the tracks are all gorgeous. The visuals in this movie are unbelievable. The textures, backgrounds, and foliage are beautiful and packed with detail. Every time you watch this movie, you’ll notice something new. The animation is also bright and colorful, and the action sequences are pulse-pounding. Whether it’s Ashitaka protecting his home and people from a demon or Lady Eboshi and her men literally going to war with the landscape, Miyazaki and his animators know just how to frame the action and how quickly to move. Princess Mononoke is also a masterwork in the use of sound, including when not to use it; I don’t want to spoil it, but there are a couple of moments when the soundtrack goes silent in reverence of a certain being. I get chills during these sequences. Chills, from a lack of music and background sound. Brilliant. Princess Mononoke is a film with a lot to unpack. I saw it several times before some things really sunk in, but every time I see it, I love it a little bit more. It’s impressive in every sense of the word, and I don’t see any mistakes in terms of story, character, or any of the technical aspects. This film will make you feel joyous, heartbroken, frustrated and uplifted in two hours and change. I would recommend Princess Mononoke to anyone who loves the medium and definitely to those who enjoy films that dig a little deeper. Princess Mononoke is a film with a lot to unpack. I saw it several times before some things really sunk in, but every time I see it I love it a little bit more. It’s impressive in every sense of the word, and I don’t see any mistakes in terms of story, character, or any of the technical aspects. This film will make you feel joyous, heartbroken, frustrated and uplifted of two hours and change.